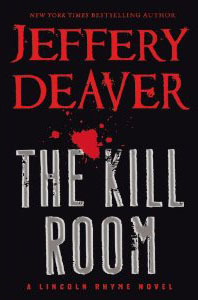 Jeffery Deaver, THE KILL ROOM: And Have You Read the Nero Wolfe Mysteries? I won't give a full review of Jeffery Deaver's THE KILL ROOM today, as he's had plenty of press for this newest Lincoln Rhyme detection novel. It features both Rhyme and Amelia Sachs, and the most significant killing in it takes place in the Bahamas. And that's what makes this an intriguing book in the series. Rhyme's quadriplegia limits his travels sharply, as well as what he can "put his hands on." He depends on an intimate group of police and forensic investigators to find his way to a solution. But in THE KILL ROOM, Rhyme leaves Manhattan and flies to the scene of the crime. And that makes the book strongly parallel to The Black Mountain, in which Nero Wolfe -- limited in his travels by both his large size and his personal preferences -- unexpectedly leaves Manhattan for Montenegro. If you haven't read the Wolfe detection series, written by the late Rex Stout, I recommend them now. Read a few as "summer reading" for the pleasure of the narrative and to get the feel of the characters, before opening The Black Mountain. I'll look forward to hearing what you think in terms of parallels and sharp differences. Coming to Kingdom Books: Eliot Pattison -- and Congratulations! Warm congratulations to Eliot Pattison, whose third book in his Colonial mystery series, ORIGINAL DEATH, was just awarded a starred review from Publishers Weekly! We are looking forward to reading the book, which will be released July 25 -- just in time for us to have copies here at Kingdom Books for Pattison's visit! That's right, this outstanding Edgar Award-wining crime-fiction author (of three series -- the other two are set in Chinese-occupied Tibet, and in a postapocalyptic America) is again coming to talk with readers and collectors in a rare public appearance. Mark your calendar for Sunday July 28 at 7 pm, and be sure to ask Dave to reserve you a copy of the new book to be signed -- we will have only a limited number. We'll also have copies of Pattison's 2012 Inspector Shan (Tibet) book, Mandarin Gate, and limited numbers of earlier books (again, make sure to reserve with Dave): dknel at charter.net or 802-751-8374. So, you're reading international crime fiction, right? And you definitely can picture the art, canals, and food (even almost smell it) in Donna Leon's Venice mysteries; you're getting worried about gray-sky days because in the Scandinavian mysteries they mean more killings and more depression; and you can't decide which African crime fiction you like better, the almost cozy ones by Alexander McCall Smith or the edgy and dangerous ones by Jassy Mackenzie. So, what are you going to do about China? I promise, I don't usually talk or write like that -- but Ellie McEnroe, age 27 and a long-term injured Iraq War veteran living in China, definitely does. Lisa Brackmann's adventurous American in Beijing keeps getting into controversy, though, and in modern China, mouthy Americans are mostly not welcome. Americans who support, hide, and have contact with anti-government artists are even more not welcome. Even with her connections, and now her mom living with her, Ellie is in trouble. Guests and artists mill around, drinking Yanjing beer and eating yangrouchuanr, which normally I'd be all over, but the meat on these is so small and gristly that I wonder if it's actually mutton and not dog instead. Or rat. I was born in the Year of the Rat, and eating my birth animal seems like it would be bad luck. So I stick to the beer. "Why are we here, again?" I ask. "I'd heard good things about the painter," Harrison says, flicking his hazel eyes at one of hte giat canvases, one where a fat naked guy whose face is done up in Peking Opera makeup lies sprawled across a red Ferrari, his guts spilling out of his sliced-open stomach. ... "I agree with you, it's disappointing." ... He's my boss, sort of. I manage the work of a Chinese artist. An important one. Which is pretty funny, considering that I know f***-all about art. Which is why, I guess, Harrison keeps trying to get me to learn. In addition to this sense of burnout, two nearly irresistible forces are on Ellie's case: (1) Somebody keeps trying to purchase her client's art, which oddly enough is not a good thing because he's in danger with the government and any sale will bring people after him right now; and (2) Ellie's mom, who seems to have run away from her American life, is trying to direct Ellie's life instead (while bringing her own Chinese boyfriend into the mix). But when Ellie goes on the run -- with her mother and said BF in tow -- a third and maybe even a fourth factor (both political/police related) press into her life. And the places she ends up running to and through are some of the scariest in modern China, because they are the most heavily polluted and poisoned and -- you knew this was coming -- doggedly made invisible by the government. Brackmann, musing on how she developed HOUR OF THE RAT, says, "Many in the West tend to think of Chinese as passive and uninvolved when it comes to politics, and while it’s true that the CCP does not look kindly upon activities that threaten its monopoly on power, Chinese people have been very vocal when it comes to environmental issues. Many of the approximately 180,000 “mass incidents” in China last year were provoked by pollution or other environmental concerns. Tens of thousands of people have protested polluting factories in places like Ningbo and Xiamen. These are issues that unite poor peasant farmers and well-to-do urban dwellers alike." In terms of Ellie's life, that means there are people who may give her some support and information as she tries to escape whoever is chasing and threatening her and the ties to these polluted places. But it also means nobody around her can afford to go on the record. 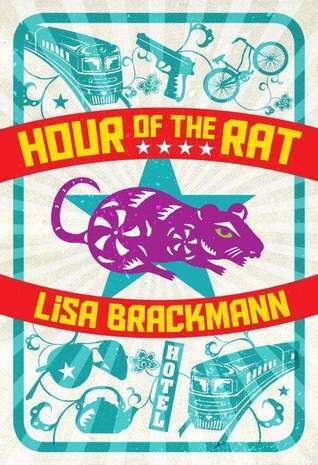 Brackmann's crime fiction is exhilarating and compelling, and I had no regrets about trading in my preconceptions about China, to absorb both the current issues and the clear passion that Ellie has for the place and its diversity. Readers don't need to read Rock Paper Tiger first, but -- why not get both books for double enjoyment? Brackmann is definitely sustaining the strong narrative voice and deft weaving of plot and character that brought her huge praise for the first Ellie McEnroe adventure, and I hope she's planning more. I'm in for this. Alerted by Hank Phillipi Ryan, we have news today that Joan Parker, loyal and loving wife, partner, and teammate of author Robert B. Parker, has died. An obituary from the Boston Globe announced that her death took place Tuesday, and recognizes Joan for her philanthropy. We are thinking of Joan's family and the many friends of this wonderful couple, in this time of loss. We're also thinking of when we last saw Joan: at the New England Mobile Book Fair, as she initiated the Robert B. Parker Award there. Here are a couple of our photos. Joan and NEMBF owner Tom Lyons. Joan reading from a letter written by Robert B. Parker. Do look at the Boston Globe's online obituary, for a particularly lovely photo of Joan Parker. I'm one of the gazillions of female readers who look forward to a new thriller from Lee Child, or an intense espionage investigation from Olen Steinauer or Alan Furst, and of course a regional police procedural from Archer Mayor or Craig Johnson ... and in fact, it wasn't until a few years ago that I realized that all the characters I identified with for years in the Lord of the Rings trilogy were guys. Honestly, I think it's easy for most of us to connect with a protagonist who makes emotional sense for us, no matter the gender. And there's something about Vanessa Michael Munroe -- better known just as Michael to her friends -- that catches me at the heart level and makes me enormously proud of her. 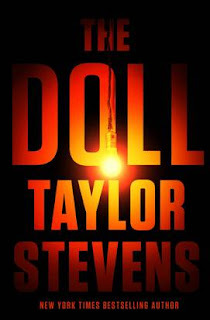 She's an information specialist (Taylor Stevens's earlier books in the series are The Informationist and The Innocent), a born linguist, and a wealthy business co-owner. Her work takes her all over the world, and as a single and slender woman in the realms of power, she's got to be able to defend herself with more than just words. She knows how. THE DOLL opens with a shockingly impossible moment: Michael's partner Miles Bradford, watching from the office window, witnesses the highly unlikely -- and therefore impeccably choreographed -- kidnapping of Munroe right in front of him. Horrified and at first scrambling against a glassy surface of lack of information, Bradford has little chance of racing to Munroe's rescue; only if she finds a way to contact him will he know what to do. Do not let her hear your language, the source had said, she will use language as a weapon. Keep the area around her free of objects, everything will be used as a weapon. Stay clear of her reach, she doesn't need a weapon to kill you. Don't use restraints, she will find a way out of them, and they will only give a false sense of safety. Do not touch her, the source said. Leave her in peace, and treat her respectfully, only then will the violence stay muted. Disrespect these and make no mistake, she will kill you. It's easy to assume Munroe's fragile and frightenable; she's female and small and pretty. But that's not who she is on the inside. Inside, she's a tornado, an earthquake, an irresistible force with brilliance of mind and a compulsion to solve problems. Soon enough, Munroe meets the depraved but highly intelligent and well-informed person behind her capture: the Doll Man, a merchant who feeds the hunger of collectors of real women, through turning them into dolls who can then be abused, abased, kept in captivity. Can he keep Munroe? It doesn't seem likely, but he's come up with carrots and sticks that involve the people she loves -- and soon she'll take his orders, in order to save her friends and family. Wouldn't you? And there is the catch, the hook, the way that Taylor Stevens binds us to this protagonist unforgettably. What we value most -- our commitment to the people we care about -- is what Vanessa Michael Munroe can't escape. How hard can she fight, and how much can she risk, in order to bring the global criminals around her to justice? I'm not always comfortable with Munroe -- just the way I stop to ask myself whether I'd let Lee Child's Jack Reacher into the house. Stevens twists this intense thriller so effectively that Munroe's questions become the ones the reader faces, too. Oh, you don't need to read the two preceding books in the series before reading THE DOLL. But I'd recommend it, because then you'll notice how Munroe is growing, in the hands of a powerful novelist. Be sure to check out the author's website, but not until you've read at least one of the books: http://www.taylorstevensbooks.com/index.php. Or, if you've got to peek first, remember Leonard Nimoy telling Star Trek fans, "I am not Spock." Taylor Stevens is not the same as her protagonist; if you have a moment, add your comments here, and give this author the gift of seeing her fiction as creative work, far beyond the pain of her own past. Come to think of it ... that's what she asks us to believe of Vanessa Michael Munroe, too. There are places whose names evoke powerful images and memories: San Francisco, or the route of the Circle Line Ferry around Manhattan, or the coast of Alaska. As the locations narrow, they call up more specific reactions: the weather station at the top of Mount Washington in New Hampshire, or a waterfall hidden in the woods of childhood. Even a kitchen chair. And Lefebvre narrows the focus further, to the "Upper Kingdom," the section of Orleans and Essex counties -- mostly Essex in this book -- where the Interstate isn't part of daily life, the mail carrier knows your family, and your management skills can be measured by the amount of dry wood you've split, stacked, and covered for the next heating season. Time also narrows here: Lefebvre's weekly column in the Chronicle, an award-winning neighborly newspaper in the area, can ramble in a mellow way through an episode on a farm, in a forest, or leaning on the counter at the general store. But as he explains at the start of the book, "When the woman I lived with became ill with cancer in 2005, I began writing about it in [that] column." Through the nine months that followed, which led to the death of that woman, artist Elin K. Paulson, the column made it possible for a wide community to treasure the connection to Elin, as well as to Paul himself. And then, in the way that loss can capture life, it also captured the column, living onward after Elin's death, commenting on what the couple's shared lives had been and how Elin's absence continued to affect the writer and the widening circles of friends. For CROSSING JACK BROOK, Lefebvre took segments of his published columns from August 1994 to May 2010, and enfolded them in commentary and reflection. In some ways it's a journal within a journal -- love on the inside, with the struggles that it takes to craft and honor a working relationship, and love/loss, a different garment, on the outside. Lefebvre makes it work well, coupled with another pairing: a time that was (including the early idealistic years of the area's most noted communal group), and a time that is and that continues. In that sense the book is a poem, and also a place of its own, a brook of moments that flash in the sunlight, then shatter. The couple also inhabited two homes: their shared one that is still Lefebvre's, and a cabin in an area now mostly uninhabited but once a busy logging village: Lost Nation. The cabin was Elin's, not just her home for many years before joining Lefebvre, but also her work of art and a display place for paintings, sculpture, and collections of stone, metal, wood. Jack Brook lay between the working world and the cabin. To cross Jack Brook was to enter a world that had been shaped or colored by an imagination nearly always in gear. "This is where we find the essence of Elin," I said to one of the boys from Island Pond who had come with me to Lost Nation a few days after her death to see what had to be done in preparation for the [planned life-celebrating] tribute. No doubt the loggers who had once inhabited the space wouldn't have recognized the grounds or the cabin. 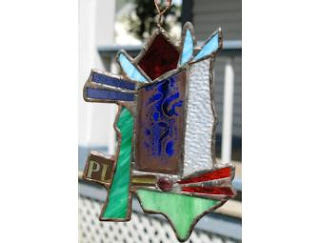 Never locked, the screen door to the cabin was fastened shut with a simple hook and eye screw, while the inner door, homemade and somewhat crude, held a geometric painting in pastel colors and a pad of paper on a string. Lefebvre's "now" commentary, framing the earlier columns, suggests that the twosome had to "mature and become more of ourselves" before they could settle into living together. The commitment that they forged saw them to a harder crossing than the one over the brook. In both layers of the book are conversations, the small exchanges of questions and responses that make up a relationship. To see Elin through Paul Lefebvre's eyes is to see an artist who pushed the edges of vision and color, while remaining practical and matter-of-fact about herself and her life. It is, in a sense, to travel the road that fortunate lovers walk, discovering what makes the beloved so irresistible, so "meant" to be there. 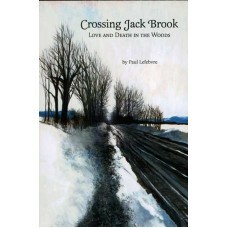 Reading CROSSING JACK BROOK conveys several gifts: a reassurance of how direct love and art can be, a caring terrain of grief, an admission of how much we all don't know about how to handle the later years of life, as lovers and friends die and the world changes around us. Lefebvre writes near his conclusion, "Writing is the only strength I have; I have no idea how my words might strike those who read them. But a friend, who is also a writer, told me that wasn't important. What is important, he said, is for a writer to open his heart." So if your bookshelf has few items that focus so tightly on a small segment of Vermont, but you have savored the writing of, say, Gretel Ehrlich or Edward Hoagland or Terry Tempest Williams, CROSSING JACK BROOK could be your delight this season. Copies can be found at northern Vermont bookstores (including Green Mountain Books in Lyndonville, Vermont, where there's a reading and signing on June 14; 802-626-5051 and greenmountainbooksmyfairpoint.net) and through the Vermont Historical Society (http://vermonthistory.org/shop/all-store-items/product/878-crossing-jack-brook-love-and-death-in-the-woods; ignore the rather lame book description there). I wish you time to enjoy this one. Maybe it's a good idea to purchase two copies -- so you have one to give to a friend who'll share the experience. It's worth the investment of the heart. Rain clouds are moving across the valley as I write; we are in for another drenched afternoon, and it's becoming "ordinary" to see flood warnings ticking across the TV screen in the evening. What a great season to dip into the newest in Victoria Houston's Loon Lake mystery series, though: DEAD INSIDER, where a catastrophic August rainstorm in northern Wisconsin includes the revelation that, neatly wrapped like butchered meat, parts of a human are floating through the Loon Lake run-off. Loon Lake Police Chief Lewellyn Ferris knows how to recruit her friends and colleagues to assist her crew in coping with the threat to health, tourism, and safety -- but the media circus that erupts when the victim's identity is revealed goes way beyond her expectations. After all, not only was the murdered woman running for the U.S. Senate, but someone is going to inherit her fortune. Along with the money comes a family heritage that's darker than most, and the possibility of multiple motives. During Osborne's first stint as the deputy coroner for the Loon Lake Police Department, Lew had discovered he could be an unexpected asset during the questioning of suspects. The reason? Men and women hear differently. Depending on the listener -- emotions, facts, even words can have ambiguous meanings. More than once each had surprised the other with an interpretation of a response that changed the direction of the investigation. Stakes are high, financial, political, powerful, and by pushing into the flood of events and desires around her, Lew raises the risk level as well. 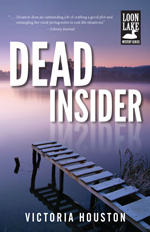 The official release date for DEAD INSIDER is June 18. Luckily, there's no need to read the other titles beforehand ... but, like me, you may decide you'd like to gather a few more for the shelf. 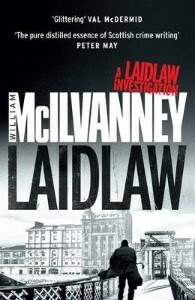 A number of blog reviews are showing up this year for William McIlvanney's LAIDLAW, first of his three noted Glasgow (Scotland) crime novels: Laidlaw (1977), The Papers of Tony Veitch (1983), and Strange Loyalties (1991). The fresh attention is due to reprinting of the first (and presumably the others will follow) as a paperback, by Canongate, in Edinburgh, Scotland. A few copies are floating across the Atlantic, and I hope there will be more. Hurrah for summer -- the season that justifies making a reading list and indulging! The northeastern wedge of Vermont that wings away from the north-south thrust of the state is called the Northeast Kingdom -- specifically, three counties that add up to about 65,000 people and a lot of second-growth forest. The region has a gentler landscape than the rest of the state; the Green Mountains fade away here, and though the rivers brought early trade and industry (along the same byways that the Abenaki tribe and its forebears traveled), towns formed late and even today are small, where neighbors know you by name. And a neighbor may live four or five miles away. The most rural part of this landscape, the town of Canaan, Vermont, hosts the action of John Vibber's second mystery, KINGDOM COME. The first printing of the book ran last summer, but two corrected versions knocked me off schedule for a review. So here we go: Now's a good time to consider picking up a copy for the summer-cabin bookshelf, or as a gift to your hosts where you're spending some vacation time. Though there are some rough edges (as expected for a self-published mystery), Vibber knows a good tale and spins a complex one here -- one that involves a militia, violent plots to overthrow the local peace, and casual murder by psychopaths who enlist each other in a tightening net of threat and danger. Cleverly, Vibber sets the book a few years back, instead of forward -- 1997, at the time when the approaching Millennium, the year 2000, brought global concerns that involved computer networks crashing, power grids failing, and political chaos, thanks to presumed issues with software and the change from the 1990s dates. Investigating a rogue group that seems to be operating out of a printing business just across the river in the wildest part of New Hampshire is Reilly Bostwick, familiar from Vibber's first mystery. Settled harmoniously with Adele Clayton (the couple has knitted well together, after the murder that put them at such risk in Shadow on Cant-Dog Hill, Vibber's first book), Bostwick has no intention of putting his family in danger again. But his daughter and Adele's, Amy Bostwick and Lottie Clayton, aged 19, need summer jobs after their freshman year of college "away." When their former babysitter, Nicole, is murdered, they have no clue there's a link to the print shop where they're seeking work. And terms like "Tribulation" and "the Rapture" don't sound dangerous, even when they're part of some odd documents that the print shop issues. "But what do these Miller Press pamphlets mean?" asked Amy. "Are they trying to make the chaos happen or trying to take advantage of it?" "I think that there'll always be huge world problems and some people trying to profit by scaring others," said Reilly [Amy's dad]. ... "I think that Miller Press is trying to stir up fear and profit from it. I don't know if this is dangerous or just ugly." Turns out it's both. Vibber's deft twisting of strands and the narrative's swift dodging from investigator to criminal and back again keep the action lively. And once the FBI gets involved, the risk actually rises for Lottie and Amy. Clear some summer hours for this adventurous local read -- John Vibber's retirement career as mystery author is providing a lively local thriller with lots of connections to what could really be happening at the next cabin up the lake's shore. Available as both softcover and e-book through that big online retailer, but you'll have more fun (and get more into the spirit of local authors!) if you ask your independent bookstore to order in a copy or two. One to keep, one to share with a summer friend.